REC were the first company to introduce a half-cut cell panel into the Australian market, with their TwinPeak series. The technology was so impressive that it won the Intersolar Award for photovoltaics in 2015 (with the highly regarded LG NeON 2). Since then, we’ve seen big manufacturers like Canadian Solar and Hanwha Q CELLS follow suit, with the later winning an Intersolar Award for their new Q.PEAK DUO-G5. Companies like Jinko and Trina have also announced they’re introducing this technology. Winning an Intersolar Award in our industry is a big deal, so two manufacturers winning with this award with half-cut cell technology indicates it’s been well received. Most of the advantages of half-cut cell panels is attributed to halving the internal current of the panel. Halving the current lowers the resistive losses, which is why the performance is enhanced. We’ll explain this first in more detail. This results in many benefits like higher output, better production per m² and better performance in heat. Shading benefits, better durability and some other performance gains are also realised with the necessary revised panel configuration. Let’s take a deeper look. Power transmission - current is reduced to save losses. In a solar module, power losses occur as the electrons travel through the cell interconnections and bus bars. Since power loss equals resistance multiplied by the current squared (P loss = R x I²), a reduction in current would reduce the loss. Splitting the cell into two halves the current (not the voltage) of the cell, so when you apply this change to the equation the losses are reduced by 75%. As current is highest in peak production times, this is when the benefit is greatest. Reducing current to reduce losses is nothing new, we’ve done it for over a century in power transmission. However having twice the amount of half current cells doubles our voltage, which would have unwanted consequences on system design. This is solved in the revised panel configuration. So if the 120 half-cut cells were wired in one string, we’d have twice the voltage and half the current of a normal 60 cell panel. To fix this, manufacturers have redesigned the cell layout to have two strings of 60 half-cut cell panels joined in parallel. The overall result is quite clever, as the voltage and current coming out is identical to a standard 60 cell panel, but the internal current is halved. This results in a 1.5-3% increase in efficiency, which is more profound than it sounds. It also has some desirable side effects. Side Note - Why not six bypass diodes? When a bypass diode activates, the entire voltage of that string is lost (find out more in my shading blog). When you join the top and bottom half of the panel in parallel, the voltage needs to be the same. If you had a bypass diode on each of the six sub strings, there's a chance the voltage won't match. Having one bypass diode that acts for both a string on top and a string on the bottom prevents this from occurring. Canadian Solar discusses the benefits of half-cell cut solar panels. 1.5-3% extra efficiency means the panel is converting more sunlight into electricity. When this is happening less heat is being generated, which lowers panel operating temperature. As panels perform better when they’re cooler, this improves performance. 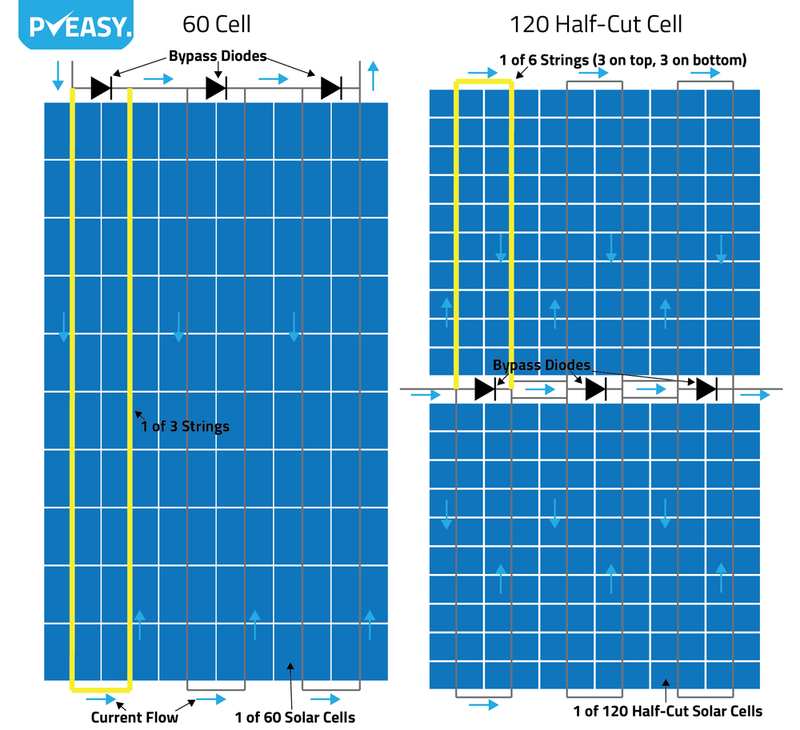 Having more power in the same amount of space (increased space efficiency) can be useful if you’re space restricted, but you might look to monocrystalline panels before half-cut cells for this. Shading is still going to have a significant impact on your system, even if it’s the scenarios favoured by these panels. The panel may behave differently on its own than it would in a string or with an MLPE device (Module Level Power Electronics, like micro-inverters or optimisers). One of the things the manufacturers push is the ability for the top half of the panel to perform unaffected if the bottom half is in shade, or vice versa. To understand this, we need a quick refresh on shading. Click to see my full shading blog post. When you shade a cell, it's current drops proportional to the shade. When you have a string of panels connected in series, your current is limited to the lowest performing cell. So when you shade a cell, your current drops to the lowest performing cell in that string. While normal panels are separated into three sub-strings, they're still connected in one big string. For more info, see my blog post on shading. When you have two strings connected in parallel (like the top and bottom half of these panels are), you can isolate the lower current cell to just that side. So one half can be producing at 10% capacity and the other producing at full. This is quite handy, but it comes with a drawback. Remember my comment, "The panel may behave differently on its own than it would in a string or with an MLPE device"? This is why it's important. Let's say you have a string of 10 panels (quite common), on a string inverter, all in perfect sunlight - except one panel which has complete shade on the bottom half. In this case, that panel could produce at 50%, but then so would all the other panels. This is not ideal. The inverter's MPPT won't let this happen though. Instead, the current will remain high and the bypass diodes on that panel will activate and bypass that entire panel. If you had an optimiser or micro-inverter in the above scenario, it's a different (better) story. That panel could then produce at 50% while the others continue unaffected. This looks at a two scenarios, one where where half-cut cells won't help and the other where they will help immensely. when will this panel perform better in shade? You're installing panels close to a northern wall, they are installed in portrait and the bottom part of the panel is shaded for a small portion of the year. Half-cut cell panels will help here enormously. For that small portion of the year, the bottom half of all the panels is cut off and doesn't effect the top half. Normal panels would almost completely shut off for that entire time. You are using tilt framing to face north and you want to put panels close together to fit another row in and produce more energy over the year. When using tilt framing, you need to space out the panels so the shading from the north row doesn't impact the row behind it. With half-cut cell panels, if the bottom half of the panel is only being shaded for a small, poor performing portion of the year, this won't impact the top half. So you can install panels closer together, install more and overall you'll get more energy. Minor shading or soiling on one half of most of the panels. It's common for the bottom half of the panels to experience greater dirt build up (soiling). When this occurs on all your panels, the lower current from the bottom half of the panels won't impact the top half like it does with standard panels. Click on image to read about Jinko's, the world's largest panel manufacturer, plans with half cut cells. In the shading scenarios above, there's added benefits than just production. The bypass diodes are not being activated, which is really good for the lifespan of the panel. As mentioned though, shading is still going to have a significant impact on your system. If your planned system will have some shading at any time of the year, ensure the person designing your system is very well versed in managing the impact of shading. The smaller junction boxes and cell shape allow for less gap at the top and added spaces between the cells. This actually improves output compared to standard panels, as it allows more light to be rebounded off the backsheet, onto the underside of the glass and back on the cell. Three small boxes on the back, instead of one bigger box, houses the bypass diodes. This enables them to be closer to where they’re required, reducing internal connections and lowering resistance. More importantly though, the split junction boxes can run 10 plus degrees cooler, improving diode lifespan. The cell interconnections expand and contract as the panel heats and cools each day. Smaller cells reduces the stress on these interconnections and joints. Smaller cells means that if a micro-crack does develop, it can’t travel as far. Smaller cells also means they flex less, reducing the chance of them occurring in the first place. Hot Spots occur when there is an area of inefficiency. This can occur in many instances, like when you have partial shading, soiling, cell damage or mismatch. Having less current can reduce Hot Spot temperature by 30 degrees. Provided you choose a good manufacturer, there aren't any show stopping drawbacks. The reason I say this is because there are twice the soldering connections, so with twice the risk of bad contacts, you want them made in a good facility. Cutting the cells in half needs to be done properly as well. The price isn't much more than a standard panel, although many manufacturers include extra features with their half-cut cell panels, like PERC, more bus bars, monocrystalline cells etc. So while the half-cut cell feature only adds a little more to the cost, you might find the panel cost a bit higher due to the introduction of other features as well. I'm personally a fan of half-cut cell panels and I believe they're here to stay. Don't purchase them because they're drastically better in shade, but in certain circumstances know that they can be. More and more manufacturers are looking to bring this technology in and they are already highly awarded, so my feeling is that we'll be seeing more of these panels.